After our traditional Sunday lunch, Norah ran down to my parent’s pond to fish with Scott and her Papa. Norah has a snazzy Barbie fishing rod. With her first cast, she managed to toss her entire rod into the pond. She ran off to get Papa. Scott waded in to get the rod. And ZIP…she’d caught a fish! Don’t ask me how I know… but the largest freshwater bass? Catfish? I dunno, was caught on a barbie fishing rod. 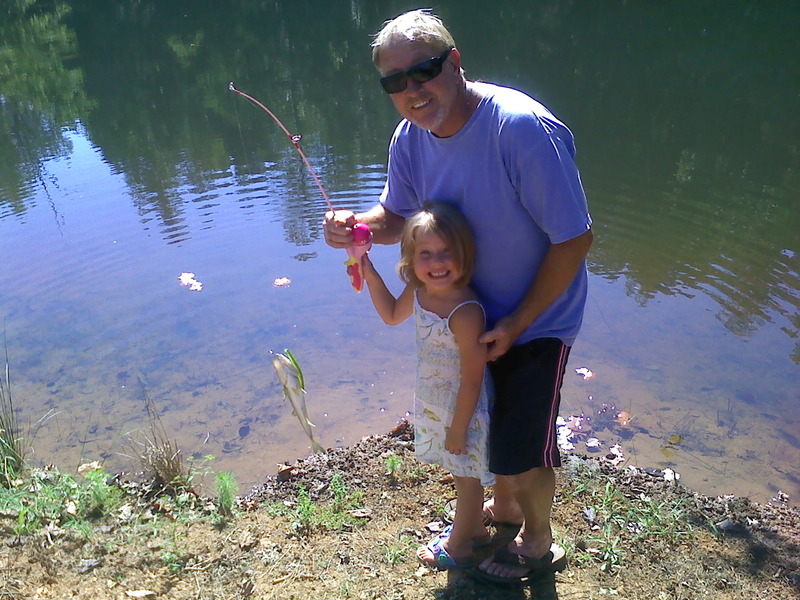 The little girl asked her papa to hold her rod while she went potty… and thus, he gets all the credit for the catch. But the barbie fishing is serious. Field and stream like. Really? And how very odd that you know this tidbit.